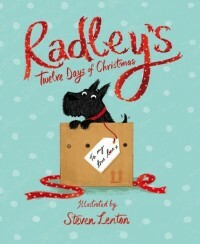 Steven Lenton, Nosy Crow and Radley worked together to create Radley’s Twelve Days of Christmas – a picture book featuring Radley, the loveable Scottie dog long-associated with the brand. Radley’s Twelve Days of Christmas takes the reader on a story through the well-loved Christmas carol, The Twelve Days of Christmas. The book is available exclusively in Radley stores and online at www.radley.co.uk with £2 from each book sold being donated to Kids Company, the charity founded by Camilla Batmanghelidjh to provide practical, emotional and educational support to vulnerable inner-city children.